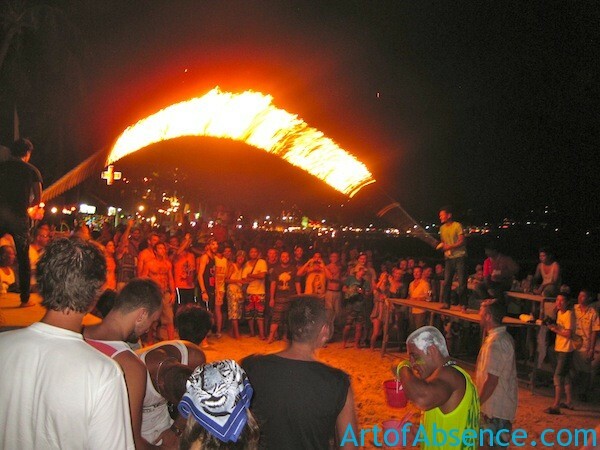 Koh Phangan’s Full Moon Party… the legendary monthly event – which as the name suggests coincides with the lunar full moon, is the Traveller’s Ultimate Party Experience. Located 70km from Thailand’s mainland, Haad Rin Beach on Koh Phangan Island is transformed into an ‘all things fluorescent’ festival mecca. You’ll find yourself immersed among flouro shirts, shorts, sunnies, beads and body paint adorning the many party revellers as they dance among the fire throwers. As you might imagine, all items are readily and numerously available once you arrive on the Island. 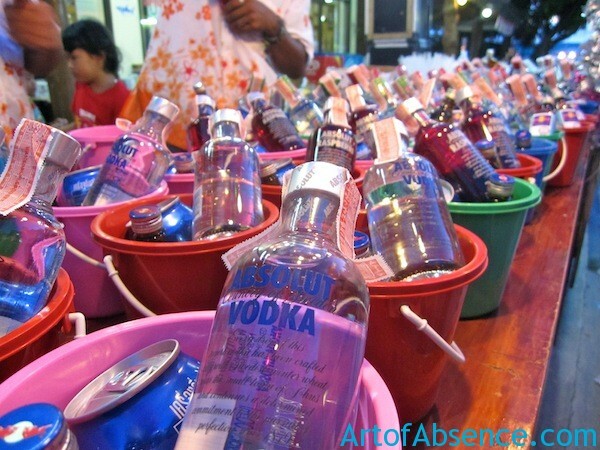 The second thing you will discover at the full moon party is that the only thing outnumbering your fellow backpackers & party revellers will be the inexhaustible lines and lines of alcoholic ‘buckets’. a mixer – normally red bull, coke, sprite or juice along will a large scoop of ice and a couple of straws. a ‘great’ Facebook photo opportunity? Although as you will discover the event of purchasing a bucket from the innumerable vendors becomes an activity within itself as the lively and often overtly cheeky vendor sellers do what ever it takes to decorate their bucket booths in order to distinguish themselves from each other, so as to get your attention. We arrived by 6.30pm – just in time to watch the sun hesitantly disappear on the horizon in the knowledge of the party onslaught that was about to begin. 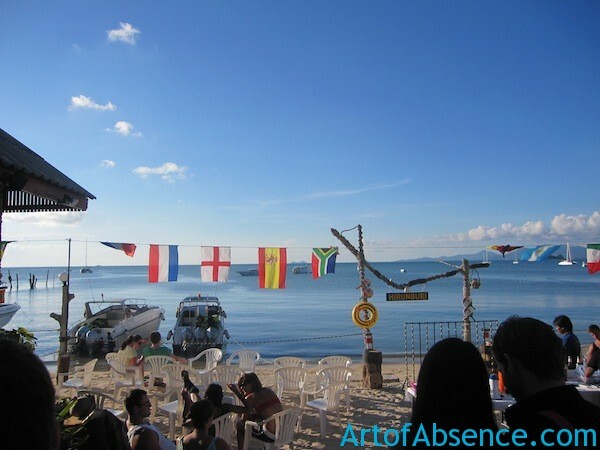 I suggest taking an early position for a cheeky cocktail at The Rock… which sits at one end of Haad Rin Beach and is one of the best places to chill out and get a view of the whole party as the beach burgeons with party-goers right before your eyes! Alongside The Rock is Paradise Bungalows – the home of the original Full Moon Party and a great spot to get one of those ‘touristy’ picks. You will need to climb up a couple of large rocks so might be best to do before you’ve skulled your 4th bucket. 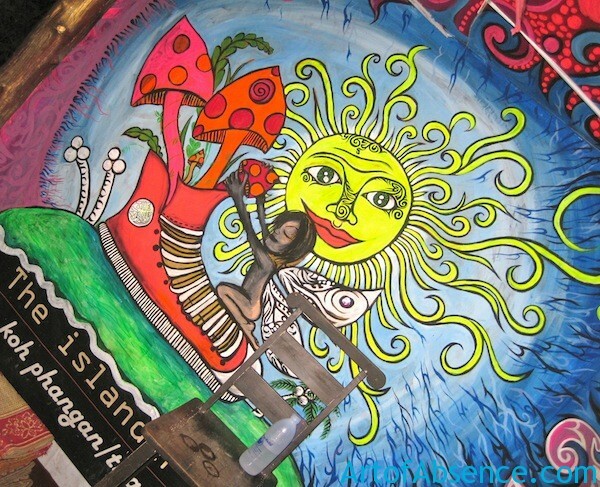 Should you wish to venture ‘inland’ off the beach for a change of pace and scenery during the night, check out the Same Same Bar and chill to some live music – busting out covers from rock to pop to a pumped up party crowd. It was our experience that the crowd that had gathered for the party had just that in mind – to party and to party hard. There was an exhilarating vibe on the beach throughout the night and the sand was the perfect base on which you could dance for hours and not even notice! We were informed by a couple we met early on in the night that they were off to find themselves a couple of ‘special shakes’ at the other end of the beach. Not sure exactly how special these shakes were – given that when we bumped into the same couple an hour later, their night was clearly over before it had begun… as they were struggling to walk and looking for ‘shelter’ on the beach. Beware the mesmerising, bewitching fire skipping ropes and slides dotted all along the beach. I say mesmerising because people are mysteriously, seemingly against their will drawn to the kerosene soaked – fire engulfed rope… and I say bewitching as even the most conservative person will endeavour to jump this rope after a couple of buckets – something one might have considered ‘insane’ upon first arriving at the island. As the night progresses, the water’s edge inevitably turns into the local latrine for males and females alike… so if you are still in a position to care, probably best not to take your evening stroll along the waters edge as the evening festivities progress. There are a multitude of casual refuelling options for you during the night. You can take a stroll back up off the beach to a sit down restaurant or indulge in some of the highly fat saturated but fabulous tasting and very economically priced – (read nearly free) vendor stall foods along the beach. My rule with respect to eating from the vendor stalls is… if I don’t see it being cooked – then I don’t eat it. We decided to stay in Koh Samui where we had been staying and take a speedboat across and back for the evening. There are many speedboat companies ferrying party-goers to Koh Phangan to Koh Samui (we used Seahawke) and the boats generally cost between 700 and 900 baht for a return speedboat ticket including pick up and drop off on return to your hotel. As the evening progresses the boats tend to get more and more behind schedule so an earlier boat is recommended – we were due to take the 5pm boat but didn’t end up actually leaving until 6pm. 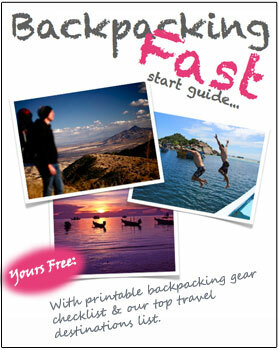 The speed boat takes approx 15 – 20 minutes to get to Koh Phangan from the northern side of Koh Samui. When we had enough and decided to leave about 2.30am – let me tell you even at this early hour it was absolute mayhem trying to bust your way through the hundreds of other drunken party goers trying to get home via the boat pier – best advice is to accept that its just going to take a bloody long while and refill your drink before leaving the beach! So drink plenty of water, eat a decent meal and think about the advice your Mum would have given you if she were there… and you should come out unscathed with some amazing new memories from one of Thailands biggest parties. Haha, I had a bucket for my 21st…150 baht! Haha yeah their pretty potent… You gotta watch they use decent alcohol too. Hahaha, I can tell you now…1 x bucket, 6 x shots and $12 later, I was royally smashed. Hey Anna sounds like you have fun. I recently returned from Thailand and ive already got the backpacking bug again. 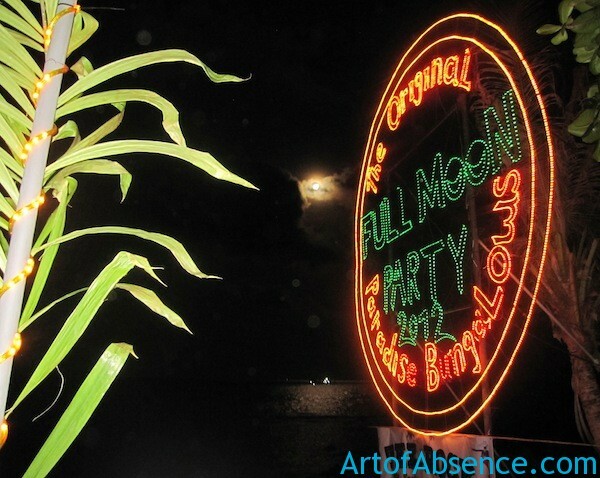 Full Moon Party here we come… see you in October…I hear this is a must do event, better that any spring break party in Florida, period. You’ll have a blast… it’s an Epic night – that’s for sure. Though we haven’t made it to Florida yet!